I took inspiration from the song 'Taro' by alt-J which describes the death of war photographer, Robert Capa, as he stepped on a landmine. I was inspired as in the song his death is viewed in a different, positive light. In the song, through his death he was reunited with his late lover, Gerda Taro, a war photographer who had previously died on the job. I took old-fashioned images from war then merged them with modern images depicting acts of love, which additionally translates what soldiers gave up for our freedom today. I later found an old-fashioned image of a couple, then took my own image with a nosebleed to subtly translate the violence at war. I separately paired and blended these images on photoshop in a way so both images were viewed equally, no image claimed dominance and made each edit follow a similar theme with peach tones against the black and white so each edit would link as a series. 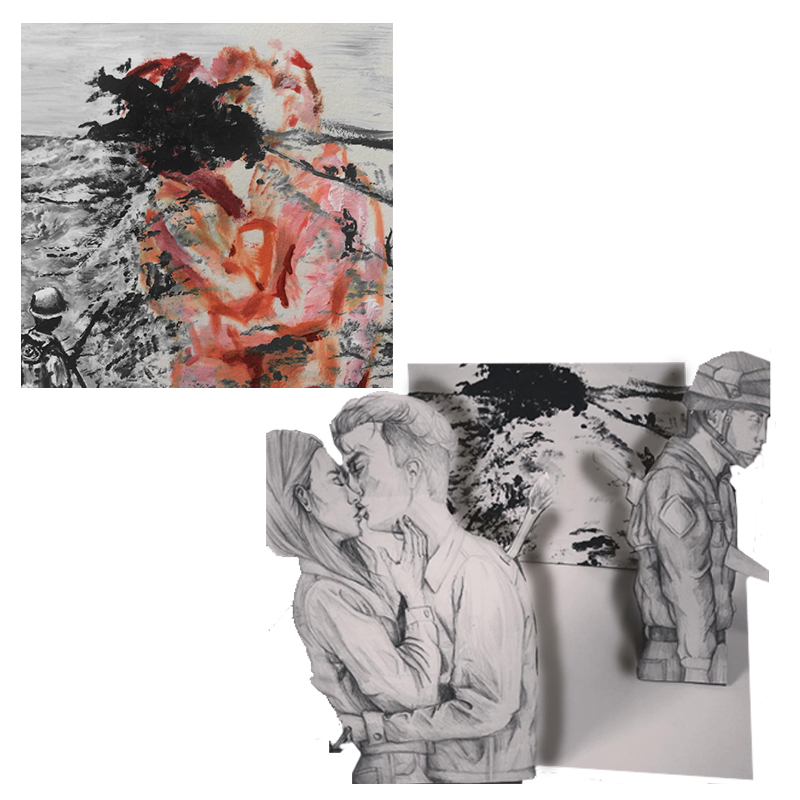 I later painted a final version of my favourite edit using acrylic paints and made a 3D sculpture of a couple and soldier back to back as the couple are impaled by Cupid’s arrow whereas the soldier is impaled by a large knife, I made this using tonal pencil, cardboard and acrylic paint.